Students in Easton, Massachusetts, will start school late Monday morning after the Patriots take on the Eagles in Super Bowl LII. 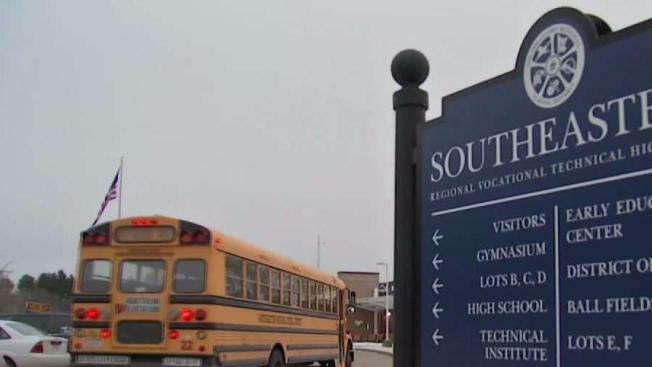 Students at a Massachusetts high school have been granted a three-hour delay Monday following Super Bowl LII. Some students in the video production shop of Southeastern Regional Vocational Technical High School in Easton created a movie to convince the superintendent to let them come in late. In the video, the students follow the superintendent around, taunting him, in good fun, until he follows through. At one point, the school's mascot even puts pressure on the superintendent. Dr. Luis Lopes says he gave in partly to encourage community and spirit. "Sometimes you kind of have to let your guard down have some fun with the kids, and we challenged them and said if attendance improves, we'll think about doing it again," Dr. Lopes said. "And they did what the needed to do." The superintendent says last year, he gave a two hour delay, and attendance at school was much better than years past. The school also thinks the Patriots will win by three points. While the kids get a three hour delay, the teachers must report to school on Monday on time for professional development.